After you have logged in and accessed eWānanga LMS successfully, we highly recommend that you change your password to something only you can remember. This ensures that access to your personal files and sensitive information cannot be accessed by others. There are two steps that need to be taken in order to change your password. * If you have already registered yourself with the Password Reset Portal, you only need to follow step 2. All students need to register themselves with the Password Reset Portal. This must be done at least once before you can change your password for the first time. You may see a pop-up log in box similar to these. 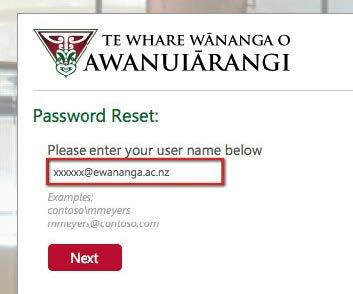 If you do, you will need to log in with your username (which is your Awanuiārangi email address). If you are a new user, your password was sent to you in a welcome letter. Please type in your login details carefully. Your password is case sensitive, so don’t forget any capital letters. After registering yourself with the password reset portal, you can change or reset your password at any time. Please see the next section if you wish to change or reset your password now. We recommend that all new students change their passwords as soon as is practical. Before changing or resetting your password for the first time, you must register yourself with the Password Reset Portal. If you haven’t done this before, please see the previous section titled ‘Registering yourself with the Password Reset Portal’. Follow the rest of the instructions to reset your password. Ensure that you use a password you can remember easily and please to keep your password information safe from others. * Only fully-enrolled students with valid login details can access eWānanga LMS, Wānanga email and Office 365. If your email address is not recognised or you are having problems logging in please contact the eWānanga Helpdesk.